Until recently treatment options for onychomycosis were limited to creams, topical lacquers and oral medication. Today’s advances in medical technology allow us to have a new and effective method to treat nail fungus: Podylas™ laser. Podylas™ is a revolutionary laser for the treatment of nail fungus, plantar warts, neurovascular helomas, as well as other pathologies of the foot such as intractable plantar keratosis (IPK), intractable plantar fascitis, metatarsalgy and post-surgical hallux-valgus. It is also indicated for telangiectasias and small podiatric surgery. Its 1064 nm wavelength provides Podylas™ with great power on the tissue (40W- 70W depending on model), with the advantages of a long-lasting laser generator and no maintenance costs. 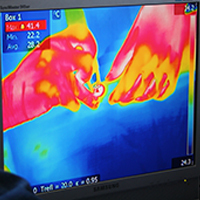 Its advanced technology causes a controlled thermal effect on the tissue which eliminates safely fungal infections in a comfortable, safe and effective way. 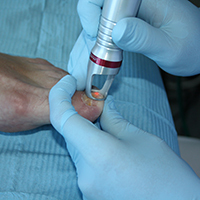 The Podylas™ laser beam is applied over the infected toenails, alternating horizontal and vertical passes to make sure that there aren’t any untreated areas left. Laser energy penetrates deep to the nail bed, raising the temperature of deep or superficial fungi without damaging the surrounding skin tissue. Treatment is comfortable for patients and very fast, since it allows to treat both feet in just 15 minutes.